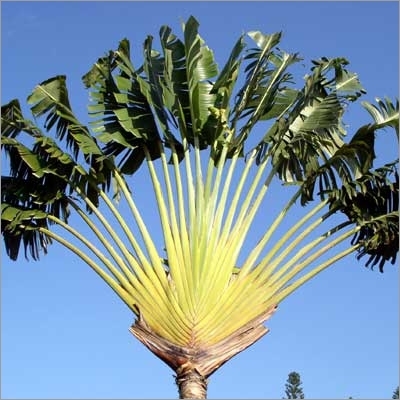 Ravenala madagascariensis, the Traveler's Palm, is part of the Streliziaceae, Bird of Paradise family. Originally from Madagascar, it grows abundantly in Suriname. 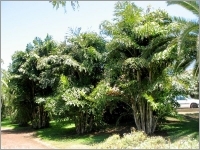 Although this plant is called a palm; it is not a true palm. It grows up to 40' tall. 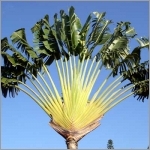 The leaves are arranged in a fan-shaped manner; it has a rather short, palm like trunk and take colorations of yellow and orange. The leaves are up to four meters in length. The small white flowers are held in bracts. The tree will bloom all year. The fruits are brown while the seeds are blue.